An amateur science and microscopy blog mainly about cyanobacteria. I don't understand why cyanobacteria keep dominating my fish-tank. But, seeing as it doesn't seem to affect the fish, I have decided to take a relaxed approach and to try and collect some data. I have also identified the various genera of cyanobacteria that grow in the aquarium. The rainbow iridescence of the aquarium biofilm and the colonies of rainbow coloured bacteria I observed within it had got me thinking about rainbows, probably because they are so familiar. I imagined that the coloured tetrads might be acting like drops of water in the air, refracting the light due to their having a different refractive index from water they're floating on, and so causing the dispersion of the visible wavelengths of light. But after some reading I discovered two problems. Firstly, the difference in refractive index between a bacterial cell (1.38) and water (1.33) is much less than between the atmosphere (1.0) and a drop of water (1.33). Would that be enough to cause dispersion? Even allowing for the EPS which is reported here to have an RI of 1.4, it seems unlikely. Second, a rainbow can only be seen in the sky opposite the sun and from an angle of 42 degrees from the direction opposite the sun. In other words, rainbows are only visible under epi-illumination at a fixed angle. 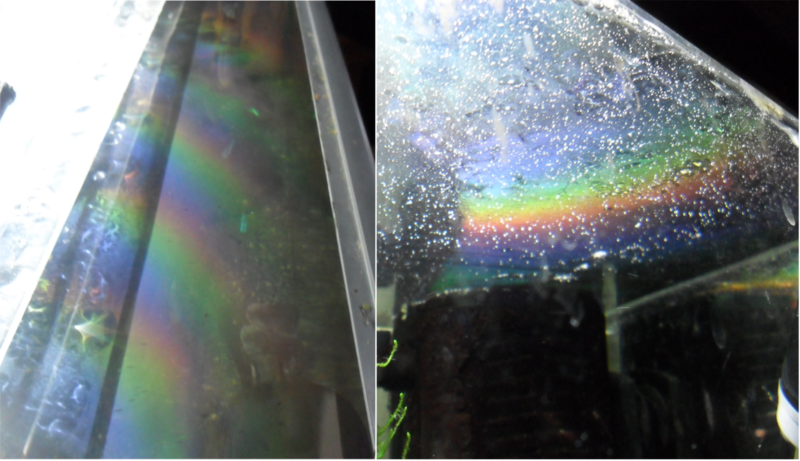 When looking down a microscope I'm staring directly at the sun and the biofilm dispersion at the aquarium surface was visible under trans-illumination and a range of angles of epi-illumination so rainbows don't make sense as a model. I decided to stop thinking about them, what I'm trying to understand is obviously very different. Further reading of the wikipedia page on iridescence led me to other ways light waves can be interfered with in order to split them into different visible colours. These effects are often caused by multiple reflections from two or more semi-transparent surfaces. They're responsible for many examples of iridescence in biology. One example is thin film interference (TFI), and I think because the description includes the word 'film' I was convinced I had found the answer. In TFI some wavelengths of light are cancelled out and some accentuated when reflected from the surface and lower boundary of a thin film. The colours affected dependent on the thickness of the film, which must be in the range of the wavelength of visible light so ~0.4-0.75 microns. It's the reason for the iridescence of oil on wet tarmac and it was while I was reading about it that I took the following photo. Iridescent aquarium biofilm formed on the top of a powerhead. To my mind this looked oily, which fitted with TFI being responsible, but the more I read the less likely that seemed. The first problem is the thickness of the biofilm. Even if it is one cell thick that's still almost 1 micron, and when I looked at a sample of the above biofilm under the microscope it looked like it had topography. Aquarium iridescent biofilm x100. I didn't see a single coloured tetrad in this sample. The second problem is refractive index again but in a slightly different sense. When light waves meet a boundary between to mediums with the same refractive index they pass straight through. So I'm not sure there would be enough reflection from the lower boundary of the biofilm to cause TFI. The third problem is that TFI seems to be all about reflected light so I'm not sure it would be visible by trans-illumination. It turned out the answer had been staring me in the face all along, if only I had read the caption to the photo of an iridescent aquarium biofilm in the wikipedia page on iridescence. The phenomenon responsible is diffraction not refraction/reflection. In the context of biofilms it seems the idea is that bacteria can grow in ordered patterns and form a diffraction grating. The spaces between the bacteria form slits, which have to be small enough to be within the wavelength of visible light, so as to split the light into it's constituent colours. Importantly "Diffraction will produce the entire spectrum of colors as the viewing angle changes, whereas thin-film interference usually produces a much narrower range". That fits with the full spectrum effects I observed in chapter 27 but not so well with the photo above which is dominated by red blue and green. I occurred to me that diffraction might also be responsible for the apparent iridescence of the coloured terads. In that case they would have to have some kind of repetitive structure in their cell walls, perhaps a protein, in order to diffract the light. Towards the end of this article there's a very interesting discussion of the possibility. I couldn't see any order or pattern to the growth of the bacteria in the biofilms I examined at x100. It looked totally random to me no matter how much I digitally zoomed in. When I put a coverslip on this sample and used a higher power objective, I did perhaps see some evidence of structure. The edges of the image are out of focus but in the areas where the bacteria seem to be forming slits, the slits do seem thinner that the width of a bacteria, which puts them in the range of the wavelength of visible light. Aquarium iridescent biofilm x1000. Could the gaps between the bacteria act as a diffraction grating? The problem was, when I put a coverslip on an iridescent biofilm sample, I lost the iridescence, so I'm not sure if this image is an accurate representation of the biofilm structure. I needed a way to examine iridescent samples at high magnification but without a coverslip and completely by accident I found one. Aquarium biofilm iridescence. Fresh sample trans (top left) and epi (top right) illumination. Dried sample trans (bottom left) and epi (botton right) illumination. Just as you would expect, the fresh biofilm sample is iridescent under trans (top left panel) a epi (top right panel) illumination. What I noticed after not cleaning my slides one evening, is that the same is true after the sample has dried onto the slide over 24 hours. This is interesting because it suggests that the biofilm structure, in terms of it's ability to diffract light, is the same after drying. The only other possibility is that the iridescence of the fresh sample is due to diffraction and the iridescence of the dry sample is due to TFI. This is more plausible than for a fresh sample because the dry biofilm might be thin enough and have a sufficiently different refractive index to glass (~1.5) to cause it. But it doesn't explain the iridescence under trans-illumination (I think) and I can see a full spectrum of colours in the dry sample iridescence which is more in keeping with diffraction. Because the sample had dried I could examine it with higher power objectives without a coverslip. Iridescent aquarium biofilm dried onto microscope slide x400 (digitally zoomed x3). The maze-like patterns formed by the bacteria apparently act as a diffraction grid. The circular objects range in size from 2.5 to 10 micrometres and are probably dried amoebae. A strong candidate for a diffraction grating was revealed I think. The lawn of bacilli, which appeared to be unstructured at x100 magnification, actually formed complex maze-like patterns at x400. It is possible to view the dried film x1000 but it is not possible to use lens oil! As a result x1000 images should suffer a loss of resolution and be effected by spherical aberration. I think there is a loss of reolution around the edge of the image but I get that with any of my objectives. The way the bacteria might be forming slots through which light waves would be diffracted is clear. Remarkably, the film appears to be one cell thick which I would never have guessed from looking at the biofilm under epi-illumination. Aquarium surface film x100 epi-illumination. I think both images also reveal that any small gaps in the biofilm are populated by other rod shaped bacteria which don't like to be crowded. Perhaps they and the tetrads produce an antibiotic which is why they're always in clearings in the film. However, in terms of whether the coloured tetrads were iridescent, the x400 image was deeply troubling. True, the coloured tetrads were still coloured (which would be expected if some kind of nanostructure in their cell wall was diffracting light) but then so were many of the objects in the image. The bacteria in the gaps in the diffraction grating appeared purple and the amoebae green. As far as I know amoebae aren't green and I can't start claiming to have discovered iridescent bacteria willy nilly. More concerning still, was that neither object was coloured at x1000 demonstrating that my optics/imaging are capable of giving a misleading representation of colour in certain circumstances. All this doesn't look good for the 'iridescent' tetrads. I needed to pause, do some more reading about chromatic aberration and also examine how my microscope in particular is affected by chromatic aberration. Chapter 27. Bacterial and biofilm iridescence. Why were some of the bacteria I observed in my last post coloured? This video is digitally zoomed and as you can see the bacteria that form tetrads are not only coloured but are changing colour. My first thought was that it was some kind of digital imaging artefact. That's human nature I think. If you see something you can't explain you rub your eyes and throw the vodka bottle away. And there's reason to be concerned. The digital camera attached to my microscope has a CMOS detector which are apparently less sensitive and more susceptible to noise than alternatives. Also, entry level digital cameras take a probabilistic approach to estimating the colour of any given pixel and, when you watch the linked videos, there is a strange static oily rainbow pattern covering the field of view. Having said all that, if it is an imaging artefact, then it's an artefact that only effects a sub-set of the bacteria in the film, which is interesting anyway. Firstly I needed to know if the observation could be repeated so I continued to allow the biofilm to form by detaching the venturi valve from my powerhead and angling its exhaust away from the tank surface. 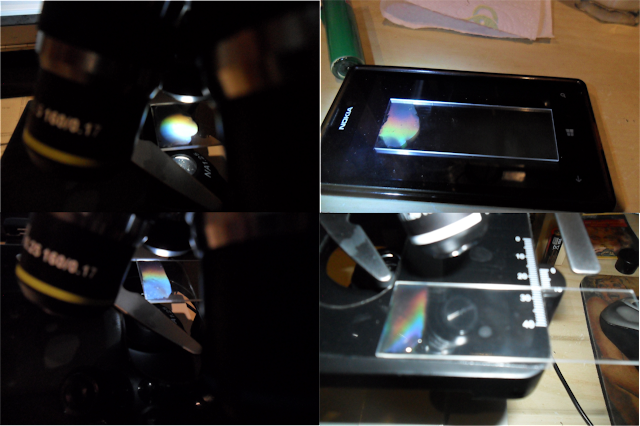 As before I sampled by dipping a microscope slide into the aquarium and scooping up a fragment of the film in situ. I then viewed at x100 magnification without a coverslip. This image was taken around two weeks after first contact. Aquarium surface biofilm in situ x100 magnification. The almost continuous sheet of bacilli is punctuated by the occasional island of coloured bacteria. The oily rainbow effect is much reduced in this image although there is still variation in background colour. I think the effect is a microscopy artefact. I can recreate and accentuate it by setting the condenser to about half way between the light and the stage of the microscope. The coloured bacteria were much less common than in the previous sample but were still easy to find. And as before they change colour over time. To produce the video I used VirtualDub to crop from 1280x1024 to 484x448 (19%) but any media player I use expands it to full screen when playing and must do some interpolation or the video would be far more pixelated. Below is a still from the cropped video expanded to 1106x1024 using GIMP to do the interpolation. Six day old aquarium biofilm x100 zoomed x5, Iridescent bacteria? I can't find any images like these on the internet. The bacteria seem to be all the colours of the spectrum, twinkling away. There is a genus of cyanobacteria that form similar grid like rafts. 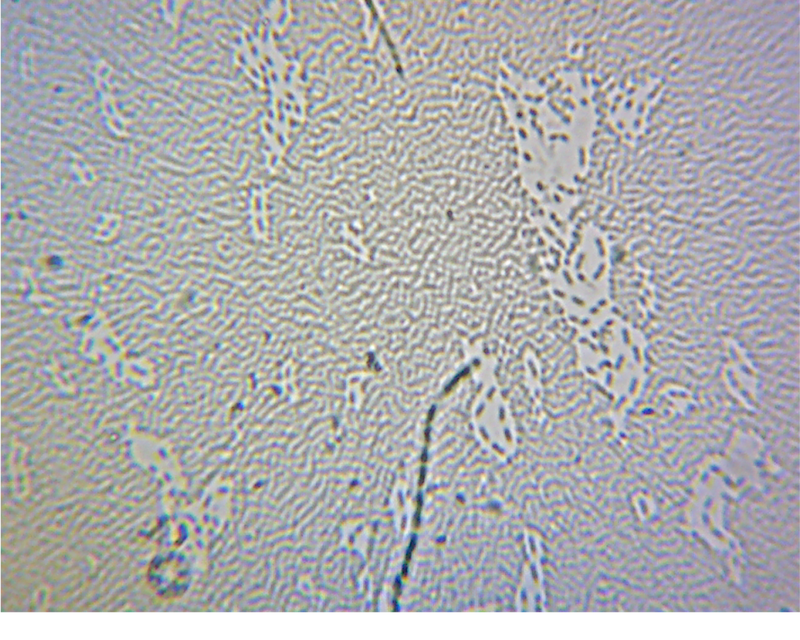 Merismopedia cells divide on two planes and so produce tetrads. They are reported to contain reddish, blue/green, violet or pink content but they seem to form much more orderly structures than these and there's no mention of cells changing colour. Importantly, the bacteria described here are not coloured when viewed under a cover-slip (Chapter 26 and subsequently confirmed) which suggests that pigmentation is not important. I might be the first person to ever observe this species so I thought I would have first go at describing them. Stubby rods 1 to 1.5 micrometres wide and 1 to 3 micrometres long. Division by binary fission on two planes to form tetrads. Forms colonies in a freshwater/air interface aquarium biofilm. Colonies range from two to several hundred cells. Cells exhibit varied dynamic colouration under direct trans-illumination. Aquarium biofilm with a colony of coloured bacteria. Four frame .GIF. The frames were taken 1-2 seconds apart. "exhibited all spectral colors ranging from red to blue only under the condition of trans-illumination"
I think they're talking about oblique trans-illumination from reading about their experimental set up, but the above description broadly fits my observations albeit at a much larger scale. So, what is iridescence, what causes it and could it explain what I have described here? It seems iridescence is an optical phenomenon of surfaces in which hue changes with the angle of observation and the angle of illumination. Given that the angle of illumination and observation are fixed when looking down a microscope, if iridescence is responsible for the changing colour of these bacteria then it must be because the biofilm fragment I'm observing is floating across the surface of the drop of water on the microscope slide. You can see this movement in the videos I have linked (movement is not obvious in the above GIF because, for artistic reasons, I nudged the layers to align better). What struck me about the wikipedia page on iridescence was that one of the the examples used was an aquarium biofilm but the iridescent pattern didn't look anything like the oily effect I remembered from my aquarium or oily effects in general. The photo on wikipedia shows a perfect rainbow with all the colours in the expected order and that's not what comes to mind when looking at oil on wet tarmac. It's usually a bad idea to rely on memory so I thought I had better start photographing the biofilm as well as examining it under the microscope. Aquarium biofilm iridescence under epi-illumination (left panel) and trans-illumination (right panel). The photo on the left was taken the day before the microscopy I've described above and the biofilm has produced a series of rainbows, one for each of the five LED bulbs in my strip-light. The effect was angle dependent. In the left panel the rainbow effect was still visible under trans-illumination. So it seemed that either my memory was at fault or I was observing a different effect. Either way, I couldn't help wondering if the rainbow coloured bacteria I saw under the microscope had anything to do with the rainbow effect on the aquarium surface. 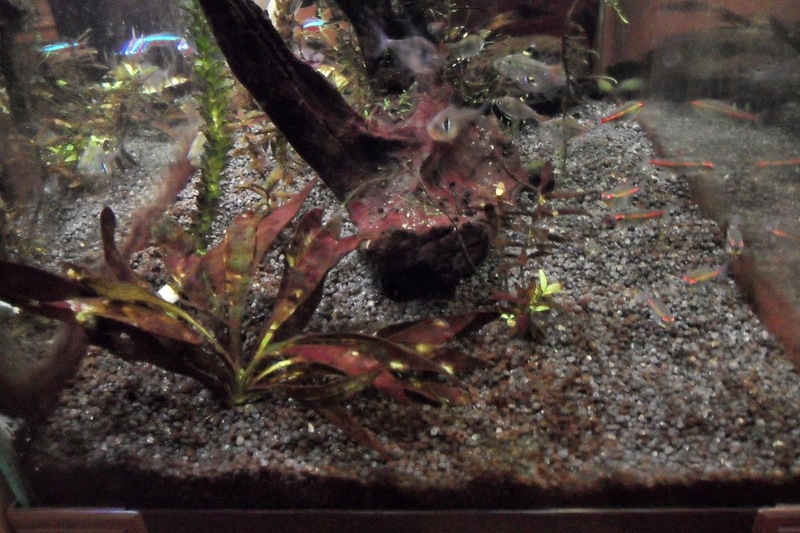 If they did then I would have expected them to be iridescent under epi-illumination just like the aquarium surface. Aquarium biofilm x100 under epi-illumination. Two frame GIF digitally zoomed x4. I captured these images by turning off the microscope lamp and illuminating the sample from the side using an LED torch. The cells in the colony of coloured bacteria in the centre seem to be different colours from the surrounding bacilli but there is no great range of colour or change in colour. I tried a variety of angles of illumination and couldn't see any evidence of iridescence in any of the tetrad colonies I examined. I wondered if converting a microscope to epi-illumination in the simplistic way I had could produce meaningful images. From what I read here there seem to be two concerns. First, my achromatic objectives don't have the anti-reflective coatings found on epi-illumination objectives. The linked video certainly has some strange arcs of light but seems reasonably well resolved. Second, all my achromats have a lens corrected to allow for a 0.17mm coverslip. This made me think because all the images I've uploaded were captured without coverslips. What effect would not using a coverslip have under trans-illumination when using such an objective and could it be that the phenomenon I have described is a microscopy artefact after all? Achromatic lenses are designed to prevent chromatic aberration (and spherical aberration) and they do this by focusing the different wavelengths of light on a single focal point under the expectation that the light entering the objective has been split into different wavelengths by passing through a coverslip. If you don't use a coverslip, I guess the light enters the objective in phase and is then split. As I mentioned earlier, when I put a coverslip on biofilm samples I loose the coloured effect from the tetrads so CA does make sense. However, and I feel a future retraction coming as I write this but, I don't think chromatic aberration could explain my observations because high numerical aperture objectives like the x100 I used are much less susceptible to CA than high power objectives and CA only seems to effect red and blue light. So, if the coloured tetrads were not iridescent under epi-illumination then that suggested that they didn't contribute to the biofilm iridescence. I wanted to understand what did cause the biofilm iridescence in the hope that it would help me understand why the tetrads were coloured. Coming soon: Imaging aquarium biofilms in situ at x400 and x1000 magnification and the mystery of the oily effect is solved. Chapter 26. Scums and slimes of the aquarium. No.1 Surface scums. If anything good has come from the previous 314 weeks of maintaining a largely cyanobacteria infested aquarium, it is that it has encouraged a keen interest in microscopy in me. Although I can take samples into work and use the microscopes there, I decided to treat myself and bought my own. The main advantages are that I can examine samples fresh from the aquariums and much more thoroughly than at work. But before I reveal anything about comparing my cyano infested and cyano free aquaria, I wanted to answer some questions I've long had about the various scums and slimes I see at different times and in different places in the tanks. I began with the white foamy surface scum that occasionally forms behind the canister filter in my heated cyano infested tank. Here the scum has been forming for two weeks. A child of still waters-white foamy surface scum. My question was, is it of biological origin? This video at x100 magnification suggests that the scum supports abundant life. I was surprised by all the activity, I have never seen such a concentration of ciliated protozoa in any other part of the tank. But the most interesting thing for me was that the ciliates were obviously swimming within a membranous structure. In the video this structure has become folded in upon itself, presumably when I scooped some of the scum up with a cocktail stick and put it on a microscope slide. But what is it composed of? A network of filaments of varying thicknesses was revealed at x400 magnification but the network doesn't look dense enough to appear as a continuous "membrane" at x100 mag in the video. My guess is that the filaments are growing alongside the "membrane". The filaments I think explain why this is a foamy surface scum as filaments are excellent at trapping air bubbles. The thick filaments are 5 to 6.5 micrometers wide and branched, I think they're almost certainly fungal. Aquarium foamy scum at x1000 magnification. 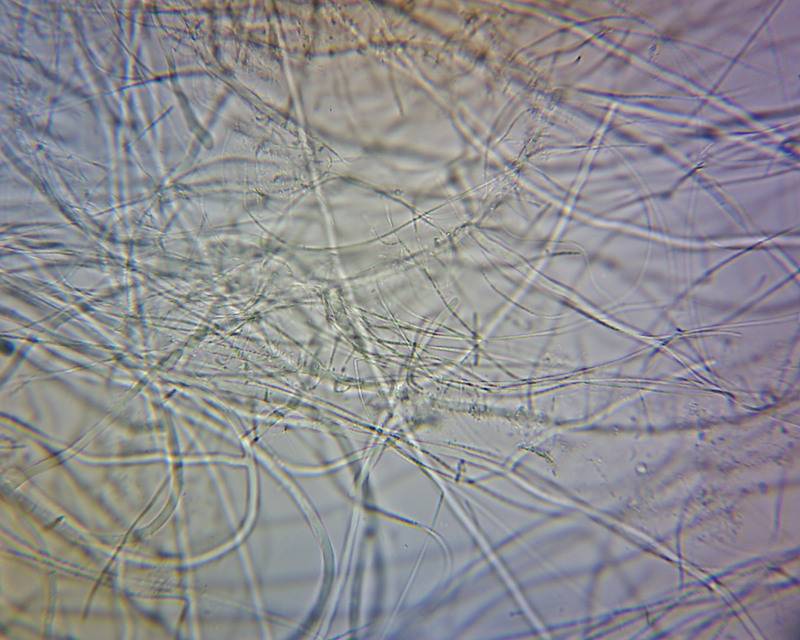 Fungal hyphae 5 to 6.5 microns wide. So, I had discovered a strange membranous structure associated with a fungal matt and abundant ciliated protozoa, but what is the food source for this community? This question led me to start thinking about my aquarium surface. I agitate the surface of my aquarium with bubbles from a powerhead and venturi valve because if I don't an oily surface scum develops. One week old aquarium oily surface scum broken up during a water change. 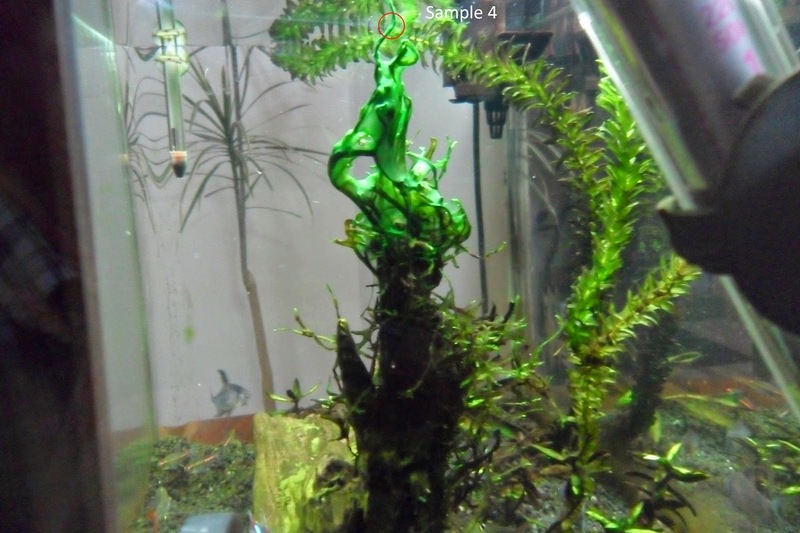 The above photo was taken after a water change in W313. Before the water change I had closed the venturi valve for a week to allow the scum to form. The scum is fragmented due to to my activities during the water change. I always thought of this scum as oily because it floated on water and in a certain light refracted light in a similar way to petrol in a puddle (although not with the same intensity and range of colour). I wanted to examine the scum under the microscope in the least invasive way possible. I dipped a microscope slide into the tank and managed to scoop up some of the scum still floating on a bead of water. I then viewed at x100 magnification so I didn't have to use a cover slip and squash the sample. Aquarium oily surface scum x100 with no cover slip. And they say it's difficult to see bacteria with standard light microscopy. Obviously there are a great many small objects floating on the surface, and they appear to be aggregated into groups. They also seem to be a variety of colours, surely they couldn't be cyanobacteria? Aquarium oily surface scum x100 zoomed digitally x12. For reasons I don't understand the cocci appear coloured and the bacilli don't . Digitally zooming in reveals that the coloured aggregates are not isolated, they exist alongside darker rod shaped objects that are not visible without zoom. Interestingly the coloured objects seem to come as pairs or even groups of four. To discover their identity I had to use more powerful objective and so put a cover-slip on the sample. Aquarium oily surface scum x1000 oil immersion, bright field. Bacilli and cocci. The cover-slip doesn't seem to have had much effect, the sample surface is still populated by large numbers of objects of various shapes and sizes although they do appear to be more spaced out. The rods are less than one micrometer wide and can be seen singly and forming chains and there are thicker objects that seem to come in pairs or tetrads. The image is very much like the zoomed image above except that none of the objects appear coloured. I think they can only be bacteria, the rods being bacilli and the pairs and tetrads cocci, but not cyanobacteria because there's no evidence of pigmentation in this image (a separate post will deal with why the cocci are seemingly coloured at x100). This was surprising because it is often said to be very difficult to see bacteria using standard bright field microscopes such as mine unless the bacteria have been stained. To be able to see bacteria without staining microscopists use specialist optics like phase contrast or dark field. But I don't think the resulting images are much better than I have observed here. So my question was, why can I see them so clearly? The best answer I have come up with is: Bacteria are difficult to see with bright field microscopes in water because they are the same brightness as water and the same colour (colourless). But I don't think these bacteria are floating in water, they're forming a biofilm. In biofilms the microbes produce a matrix of polysaccharides, proteins and extracellular DNA known as extracellular polymeric substance (EPS). So maybe the EPS is sufficiently different in brightness to the bacteria for them to be seen. I also think it helps that the bacteria have stuck to the underside of the cover slip because, as you can read here, this is one of the few circumstances where the image wouldn't suffer spherical aberration at x1000 magnification using an oil immersion objective. However, there's more to this biofilm than just bacteria and EPS. Aquarium oily surface scum x1000. Bacteria, cyanobacteria, protozoa and plants. The bland looking oily scum had turned out to be a rich community of microbes and small plants. I find it easy to imagine this thin film evolving into the foamy scums I see in areas of low flow, especially given an extra week to form. Maybe the membranous structure seen at x100 is this film of EPS/bacteria, fungi and cyanobacteria. In this video it's obvious that the protozoa are underneath the bacteria stuck to the underside of the coverslip. It also shows that the bacteria can appear either as dark objects (as above) or light objects on a darker background. Depending on where in the field of view they appear. In conclusion the foamy surface scum is indeed of biological origin. Chapter 25. Resident from another order. Cyanobacteria identification 8. Change in my aquarium comes slowly (if at all), so I was interested when a fluffy brown organism began growing on my bogwood. W312. 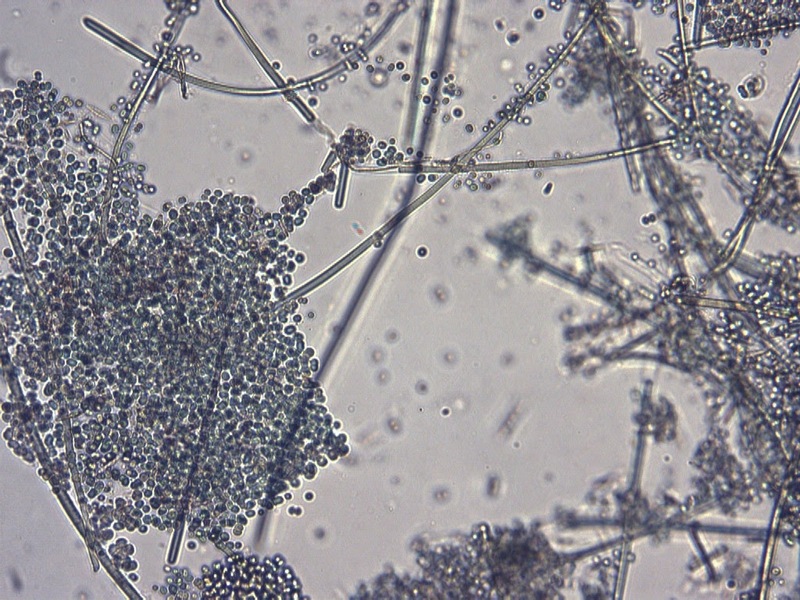 The brown fluffy organism attached to the bogwood is probably cyanobacteria from the genus Scytonema. Previous experience suggested that it was some form of cyanobacteria (almost every sample I have ever examined from the tank has turned out to be some form of cyanobacteria) but it had some unusual characteristics that made me wonder. Most noticeably, during the weekly water change when I remove the bogwood from the tank and scrub it with a toothbrush, this organism remained attached. This was not true for any of the other species I have described, although the brown unicellular species can take a lot of effort to remove (Chapter 18). Scytonema filaments sampled from an aquarium ornament (x100 magnification). 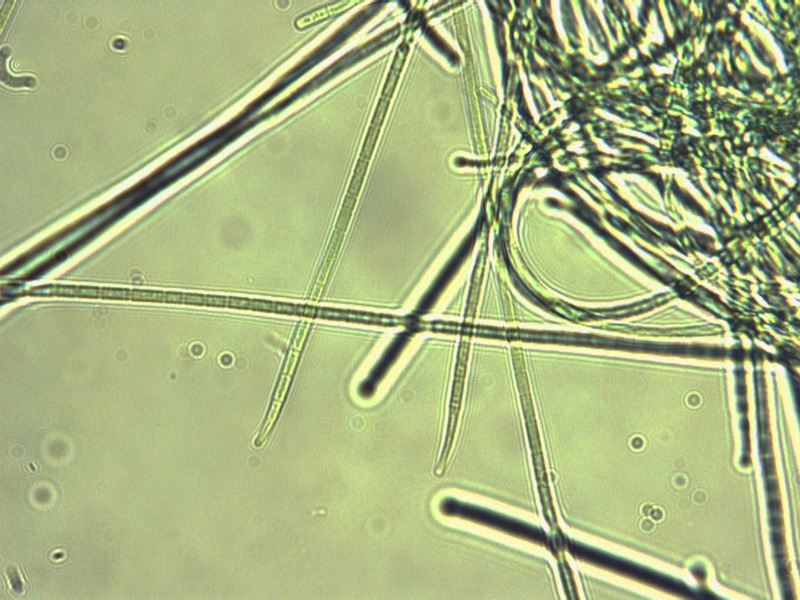 At x100 magnification a network of what looked very much like cyanobacteria filaments was revealed. But from which genus? Returning to "Freshwater algae of North America: ecology and classification" (Wehr and Sheath Eds) and specifically chapter 4 on filamentous cyanobacteria, I made the following identification. Q1-Heterocytes and/or akinetes develop commonly or occasionally in trichomes? Scytonema filament with a heterocyte. Filament width 14.5 to 16.5 micrometers (x1000 magnification). From reading descriptions of heterocytes (cells specialising in fixing elemental Nitrogen N2) I would say the cell in the centre of the above image is a heterocyte (heterocyst). It looks very different from the other cells in the filament as it lacks the brownish pigment and cytoplasmic granules. Notice the pores connecting it to adjacent cells are clearly visible. 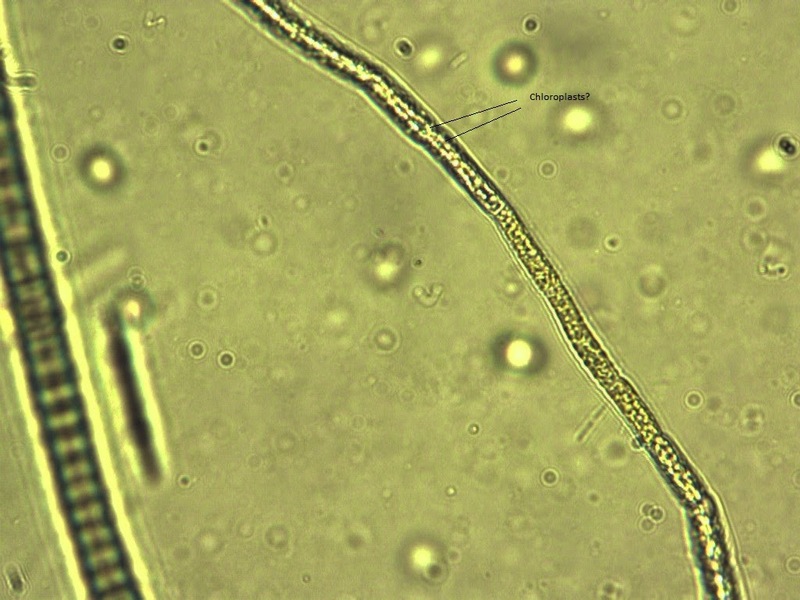 The presence of heterocytes is significant for two reasons: Firstly because it means that this species is from a different order of filamentous cyanobacteria to those previously identified which were all Oscillatoriales; Secondly, because it suggests to me that N2 levels in the aquarium must be very low indeed. 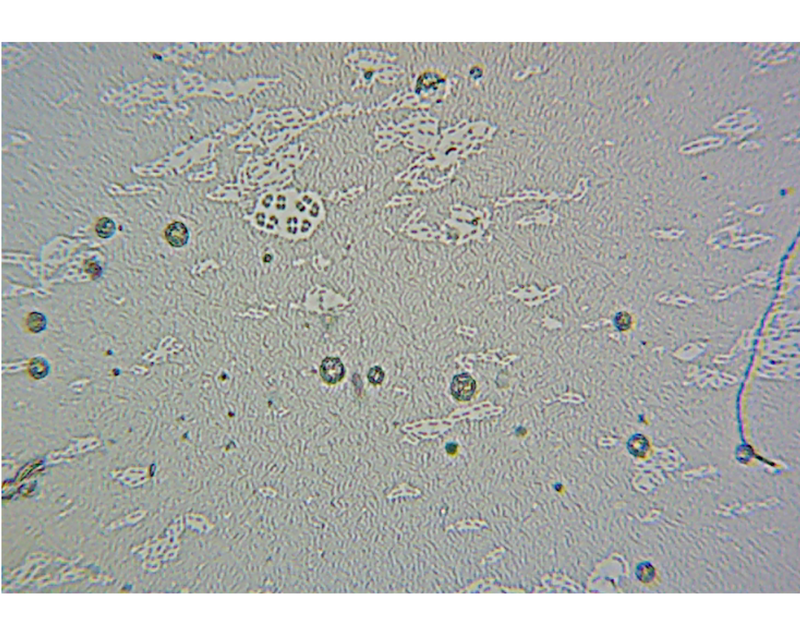 I say that because according to "Freshwater algae of North America" the frequency of heterocytes along the filament declines with greater levels of NH4+ or NO3- and I see lots of heterocytes. So I can say that a species of cyanobacteria that is not only capable of N2 fixation, but that is actively fixing N2, has out competed the cyanobacteria/algae normally found on the bogwood (see Chapter 22) . Q2-Trichomes never branched or only with false branching? The branches below look like diagrams and pictures of false branching to me, so I say yes and that means this species if from the order Nostocales! Q3-Filaments with lateral false branches? Yes. Q4-Filaments isopolar, solitary, entangled in clusters, or forming woolly mats with common lateral branches in pairs (V shape), or rarely with single (Y shape) branch? I don't see lateral false branches in pairs, but I do see the rarer Y shape branches so Yes=family Scytonemataceae. Q5-Trichomes cylindrical up to the ends, apical trichome ends not attenuated, end cells more or less rounded? Yes=genus Scytonema. Once again my aquarium has proven itself an ideal habitat for cyanobacteria, which seem to be increasing in diversity. Also, Scytonema provided a good first test of my new microscope and camera which have captured some beautiful detail I think. It's a shame that cyanobacteria look so manky from a distance. I see it's been 21 months since I last updated this blog. The reason is that I still have a cyanobacteria problem. I was expecting the tank to transition to a healthy cyano free state at which point I would post the data I have been collecting relating the abundance of cyanobacteria to levels of phosphate, nitrate and pH. I wanted to make the point that cyanobacteria problems can disapear spontaneously with no input from the fishkeeper. But after 21 months there seems little point waiting longer. I wouldn't want to advise someone with a cyano problem to wait two years and see if it goes away. W302. The Cyanobacteria is not as bad as it has been but, let's be honest, it's not great. So here I am, cleaning my aquarium every week because it looks diseased and smells if I don't, while wondering what the point of cleaning my aquarium every week is. And all this happening while my unheated tank in the front room is cyano free. I replaced my unheated tank with a bigger one around 21 months ago (coincidently) and have never had any cyano problems with it. It seems to me that I should compare the two aquaria to see if anything can be learned about the causes of cyanobacteria problems. As I wrote in Chapter 22, by week 196 I observed filamentous cyanobacteria had returned to my freshwater tropical aquarium. I felt there was enough of it to test the ability of aged water (AW) to reduce its abundance. To re-cap, I had previously observed two occasions where the use of AW had apparently led to a reduction in the abundance of cyanobacteria. Firstly in Chapter XI (W112-W120) where I saw a dramatic reduction within five weeks and almost complete disappearance within eight, and again in Chapter 21 (W148-W160) where I observed a dramatic reduction in 12 weeks. In order to replicate the conditions when I first used AW I used a brand new water container to mature the water. I have to say, I was pretty confident it was going to work. And this third test would have been sufficient to convince me that keeping 20 litres of water heated to tank temperature and aerated for a week prior to adding to the tank was an effective way of controlling cyanobacteia (in my aquarium at least). W197. Photo taken before the fist aged water (AW) change. The tank is in the early stages of a mixed Geitlerinema/Lyngbya infestation. W209. Photo taken before the twelfth aged water (AW) change. The tank is dominated by a Lyngbya infestation. However, it's obvious from the photos above that on this occasion, using AW has not resulted in a reduction in the abundance of cyanobateria in the tank. Indeed, the cyanobacteria problem has got much worse during the 12 weeks I used AW. Consequently I have to conclude that there is no benefit in using AW. This raises the obvious question, what was the reason for the dramatic decline in cyanobacteria abundance I observed between weeks 112-120 and again in W148-W160? And why were both these episodes followed by long periods where filamentous cyanobacteria were rare? The only macroscopically visible cyanobacteria in the aquarium were the brown unicellular types for 26 weeks following W120 and for 31 weeks after W165. Given that its disappearance seems to have nothing to do with using AW (and equally that its reappearance has nothing to do with using fresh tap water), I have to admit that after four years I am no further forward in understanding the causes of my cyanobacteria problem. Although I note the problem has changed subtly. During the first two years and three months the tank was in existence, I can't remember any occasions where the cyano died back spontaneously as it seems to have twice here. It is the cyclical nature of my current cyanobacteria problem that interests me. So my plan is to do absolutely nothing new and see if the cycle repeats. When that might be is unclear. Regular visitors to this blog (if any) will know, that at some point after Chapter 21 (W160) I observed an increase in the abundance of cyanobacteria in my tank. Early signs were that a rapid return was likely. W165. The cyanobacteria growing on the tank walls is a bad sign in my experience. But the infection didn't take hold, when I syphoned off the mats on the gravel in the above photo, they did not re grow by the following week (W166). In fact the tank looked relatively cyanobacteria free for a long time. All photos taken immediately before water changes as always. W190. 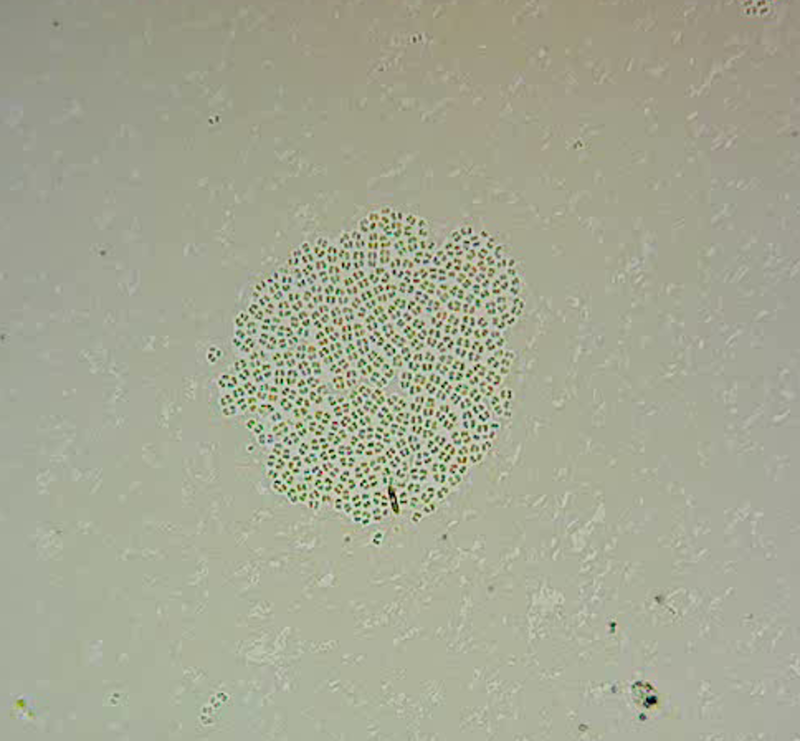 Unicellular cyanobacteria in a freshwater aquarium. Thirty weeks later by W190 (using fresh tap water for water changes for the previous 28 weeks) I could not honestly claim to have a cyanobacteria problem. This was the longest period that the tank had ever gone without one. There is obviously abundant brown unicellular cyanobacteria on the Amazon Sword and some on the gravel (there's even some growing on the tank walls near the gravel) but I did not feel there was enough to test if using aged water reduced it. 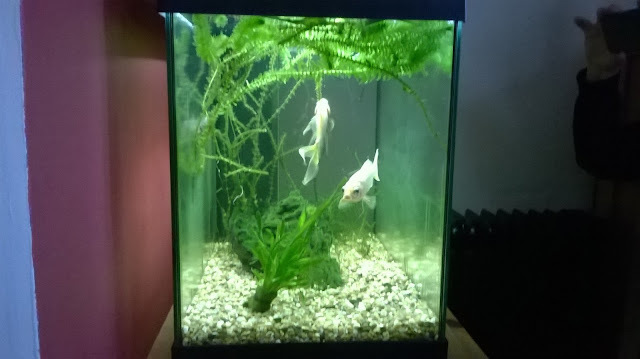 I began to question my belief that my fish-tank was fundamentally predisposed to the excessive growth of cyanobacteria. W196. 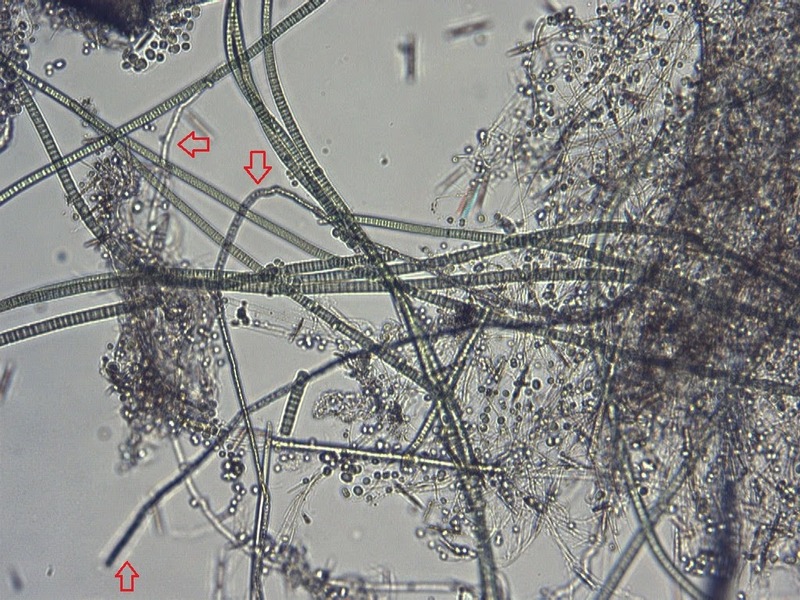 An inventory of cyanobacteria from a freshwater aquarium, see below for microscopic examinations of material from the labelled areas. I feel I should stress that I had not consciously changed my tank management practices in any way during the six weeks separating the taking of these photos. I continued the same weekly 37% water changes and gravel syphoning as for the previous 30 weeks. And yet by W196 there had been an obvious shift from brown unicellular cyanobacteria to blue green filamentous species. This is significant as it seems that these filamentous forms are much more capable of growing on the tank walls and gravel and consequently make the tank look far less healthy. In a way I was pleased as it gave me another opportunity to test if using aged water reduced the abundance of cyanobacteria. It also gave me the opportunity to test my belief that I can identify which species of cyanobacteria is growing in my aquarium from its colour and growth habits. 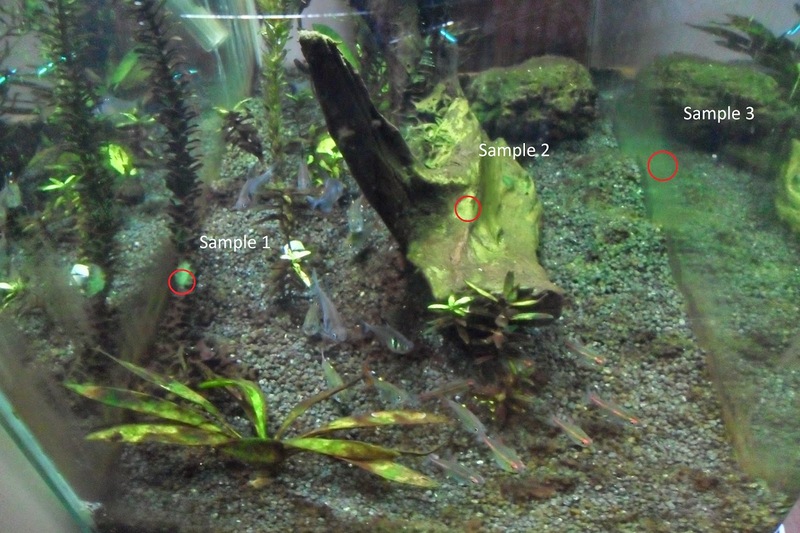 Sample 1 has the lime blue green (almost turquoise) of species 2 (possibly Lyngbya, see Chapter 20), as does the species on the tank wall (Sample 3). The fact it can't grow far up the tank wall is also characteristic of species 2. Sample 2 intrigued me, it looks strangely green. I guessed it was some sort of mixture. Sample 4 has the dark blue green colour and tendency to form sheets around plants characteristic of species 1 (see Chapter XVI). Sample 4. W196. The sheet forming cyanobacteria growing on the Java in mid-water is probably either Jaaginema or Geitlerinema. Sample 1. Scraped from an Ellodea plant. Unicellular (multiple species) and filamentous cyanobacteria (possibly Lyngbya) from a freshwater aquarium. The filaments are 8-10 microns wide. These filaments look like Lyngbya as identified in Chaper 20. I'm not surprised there is so much unicellular in this sample as, when I took it, it was clear the blue green mat was growing on top of brown material (see Chapter 18 for higher magnification images of the unicellular cyanobacteria). Sample 3. Scraped from the front tank wall. Filamentous (8-10 microns) cyanobacteria (possibly Lyngbya). Again, very similar to the thick filaments in Chapter XIV and Chapter 20. I observed abundant evidence that these filaments have sheaths, which is a defining characteristic of this genus. Lyngbya is dominating the tank walls at this stage it seems as the sample contained little else . I notice now I upload this picture that there's a mystery filament running diagonally across the top right corner. Sample 4. 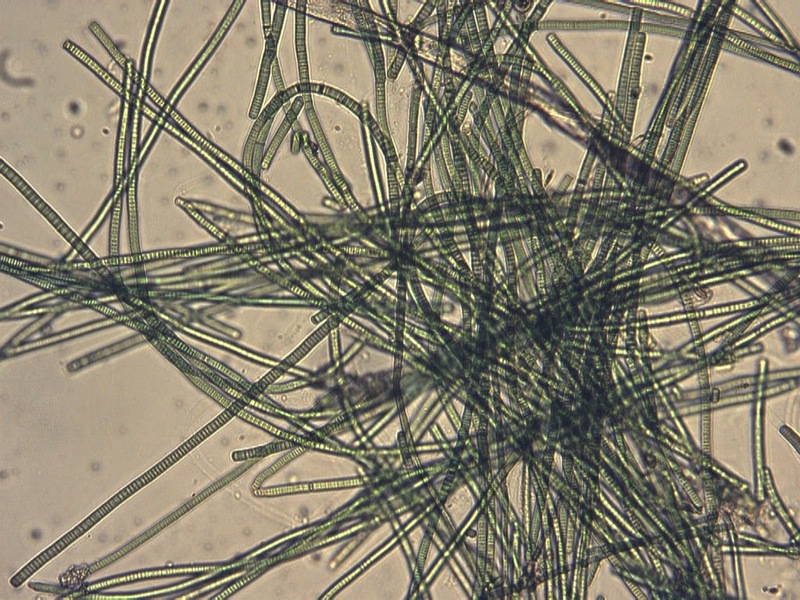 Sheet forming cyanobacteria sampled from a Java Moss tendril. Possibly Jaaginema or Geitlerinema. Filaments are approx. 2 microns wide. I didn't take any good low magnification photographs of this sample but it consisted almost exclusively of the above filaments. They look very similar to the filaments identified as Jaaginema in Chaper XVI, but that I now think may be Geitlerinema (see below). Sample 2. Scraped from the bog-wood. A complex mixture of cyanobacteria and algae? The sample was very diverse under the microscope but was mainly composed of all cyanobacteria species described here so far except the mysterious species 3 (Chapter XVI). There is also a new type of filament. The jagged filaments (there are three in this picture) are unlike the others. I could find no mention of cyanobacteria filaments articulating at the cell junctions in this way in either phytokey or the identification key I use. Notice how the species 2 filaments are laying on the glass slide like wet string. The new filaments move in and out of the focal plane of the microscope continually. This suggests to me that their cell walls have more rigidity and presumably are made of different stuff. Sample 2. 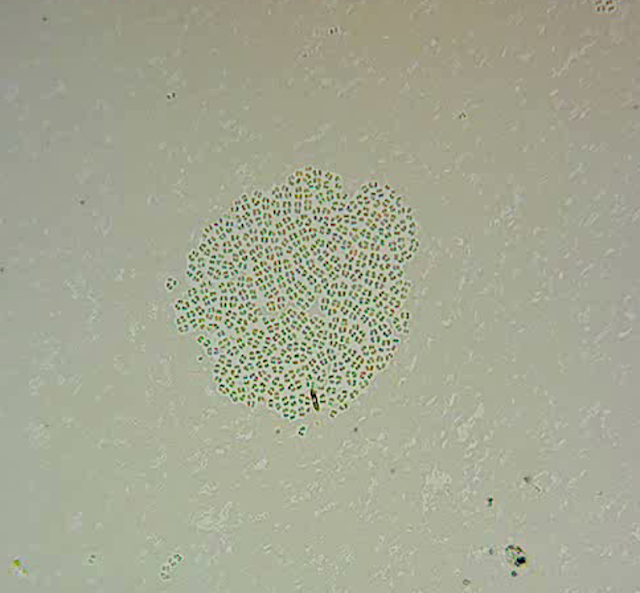 Possible algal filament, a eukaryote at last!? One possibility is that they are algal filaments. If so the cells should contain discreet structures that contain the photosynthetic pigments called chloroplasts. There do appear to be flecks of coloured pigment in the above image so it's a possibility. It would explain why the bog-wood looks so green. As you can see in this video, both the thick and thin cyanobacterial filaments are moving longitudinally. In Chapter XVI I identified the thin filaments as Jaaginema because they didn't move. Here I have to say they're more likely to be Geitlerinema filaments. It's possible that I used to have a Jaaginema infestation but now have Geitlerinema, which might explain why species 1 hasn't taken over the tank on this occasion It's also possible that I have always had Geitlerinema in the tank. The description of Geitlerinema on algaebase sounds much more like what I have observed of species 1 than the Jaaginema description I posted in Chapter XVI. Chapter 21. Does using aged water reduce cyanobacteria in my aquarium?